THIS POWERFUL HERBAL FORMULA DISINFECTS AND PURIFIES THE AIR! 100% PURE Essential Oils of Eucalyptus (eucalyptus globus) Leaf, Lime Peel, Lemon Peel, Grapefruit Peel and Orange Peel. There is MORE Bacteria, Virus, Fungus, Infection, Pathogens, Antigens, HARMFUL Micro-Organisms and just plain Germs in the air of a Hospital, than anywhere else. But soon after I opened up my Clinic I realized, that the air was literally germ-laden there too and my assistants and I were in there breathing this air ALL day long. It also smelled just plain BAD and was down right depressing. So I bought a Nebulizer, that would disperse Essential Plant Oils ALL day long into the air, that were naturally disinfectant and also made the place smell BETTER. In the second decade of my clinical practice, my reputation as a doctor spread so consequently, I was working on people that were MUCH sicker. Hundreds of Cancer Patients, wasting-away Diseases, AIDS, Parasitical Infections etc. Not to get gross, but when Graduates would come from Schools ALL over the world and intern with me, they were HORRIFIED with the amount of Blood, Pus, Dead Flesh, Parasites and Infection, that would literally be leaving my Patients and end up being deposited in my Clinic! The point is that my little Essential Oil Nebulizer wasn't POWERFUL ENOUGH anymore, NOR were the Oils STRONG ENOUGH! So I put an even STRONGER Herbal Essential Oil Formula into a Spray Bottle. Finding POWERFUL ENOUGH Herbal Essentials Oils was one thing, but finding a Sprayer that would hold up to the FULL-Strength Essential Oils is another. We melted a lot of Spray Pumps. I eventually got the Formula and the Dispenser together and within a few days my Patients were asking to buy it for their own homes. My AIR DETOX is the EXACT Formula, that I used in my Clinic. I needed something STRONG to cleanse and purify the air, but also something STRONG ENOUGH enough to de-odorize the smell of Disease and Death along with a Fragrance, that could LIFT the LOWEST Spirits. My AIR DETOX is a FULL-Strength blend of VERY POWERFUL Essential Oils, that DESTROY Bacteria, Virus, Fungus, Infection, Pathogens, Antigens and HARMFUL Micro-Organisms on contact. It also IMPROVES the smell of the air with a delightful Eucalyptus/Citrus Odor. I designed this Blend NOT only to be the MOST POWERFUL Germ-Killing Formula, but also for the Aromatherapy Action of LIFTING the Spirits and clearing the Mind. Often my Patients with Degenerative Diseases were depressed and I needed to do ANYTHING and EVERYTHING, that I could to get them to be POSITIVE. I needed Herbs to RAISE their Spirits too. I have ALWAYS found it interesting how closed-minded and medical we have ALL become. Our Ancestors used these Herbs NOT ONLY for their Medicinal value, but also for there Emotional and Spiritual VALUE. These Herbs were also used to cleanse the living environment of BAD Feelings and HARMFUL Spirits. As a culture, we accept what our Ancestors said medically, but discard the Emotional and Spiritual BENEFITS of Herbs. Well, just like they say there are NO Atheists in foxholes, in my Clinic we looked for ANYTHING that worked, and when it did, we used it. Eucalyptus Oil, Lime Oil, Lemon Oil, Grapefruit Oil and Orange Oil ALL contain VERY POWERFUL Essential Oils. These Oils have been WIDELY studied and tested and are proven to be a FULL-Spectrum Anti-Microbial. They are a POTENT and EFFECTIVE Broad-Spectrum Bactericide, Fungicide, Anti-Viral and Antiparasiticide. 1 or more sprays HIGH into the air to disinfect and purify the area. GREAT on your Pillow before bed and in your Bathroom as an Air-Freshener. This is 100% PURE Essential Oil, NOT diluted and NOT some wimpy Air-Freshener. Use sparingly. A LITTLE goes a LONG way. Since it's VERY CONCENTRATED, do NOT use internally, externally or spray into the Eyes! This product may stain or discolor whatever it is sprayed on. None of the above statements have been evaluated or approved by the Food and Drug Administration or the American Medical Association. 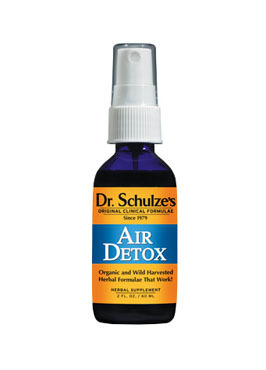 Purchasing Dr. Schulze's AIR DETOX, Then Please CLICK HERE And HERE. Editor's Note: About 10 years ago, I had SEVERE Bronchial Pneumonia and did OZOL Inhalation Therapy, using Dr. Schulze's Clinical Air Treatment Formula (now known as AIR DETOX) in my BIOREGENE Nebulizer, and I was COMPLETELY healed in less than 24 hours! !